Before talking about the special characters of the Romanian language (diacritics), I would like to briefly recall the meaning and origin of the word ‘character’ as it is understood in this context. We must distinguish between inannzitutto glyph and grapheme. Glyph is derived from Greek and means “influence”. This brings us immediately to hieroglyphic signs (in greek means “sacred signs”) that indicate any message, engraved or painted, like those used by the Mayans and Egyptians. The grapheme is the smallest unit of a distinctive writing system, not further subdivided, which corresponds to a character of the alphabet. A grapheme is a unit of text as a glyph is a graphics unit. a glyph is an abstract representation of a single grapheme, graphemes, or part of a grapheme. Most of the glyphs in typography are the equivalent of typefaces, which make up the series called “font”. as well as in typography, the term “character“ refers to a grapheme, as we find in common writing systems. In particular, a computer font is an indexed collection of glyphs containing information on how to associate a particular code, display them in different sizes, and print them correctly. A diacritic is an ancillary glyph added to a letter, or basic glyph. The term derives from Greek and means “distinguish”. Diacritic is both an adjective and a noun, whereas diacritical is only an adjective. Some diacritical marks, such as the acute (‘) and grave (`) are often called accents. Diacritics may appear above or below a letter, between two letters, or in some other position. The alphabet of the Romanian language is made up of twenty-six letters of which eight are vowels and consonants. The remaining letters, however, contain some ‘special characters’. Five total, better defined as characters or diacritical marks that characterize the Romanian language and affect correct pronunciation, transcription, and especially meaning. Here are some useful tips to display and print Romanian diacritical characters correctly. The purpose of these short tips is to help those who receive the file and are faced with text that contains strange symbols or appears to have numerous typos. On keyboards used for the Windows operating system, the ‘special characters’ are typically placed on the right side of the keyboard. The Italian keyboard follows the QWERTY standard defined by the sequence of 6 keys in the first row of letters. … you are definitely in the shelter of these problems, although not entirely. 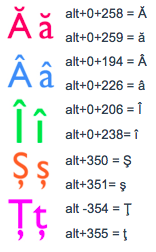 Unlike Microsoft, Apple has always focused on the aspect of the font for many years since the issue of diacritical marks, such as those in the Romanian language. Because of this, Mac users don‘t encounter many difficulties. Even the keyboard follows the standard QWERTY and features a Keyboard Viewer, a very useful tool in this context. If you wish to learn more go to Unicode website. Before you start to deal with character encodings, it’s important to clarify the concepts of repertoire, character codes, and coding. The terms are often confused, especially when it comes to the Internet. For character repertoire is a set of characters. It can be determined based on the language that is or may be language independent. The Latin alphabet is a good example of repertoire regardless of the language it represents. The ISO 8859 family extends the repertoire of characters by introducing special characters depending on the language used. As mentioned earlier, this includes the ISO 8859-1 (ISO Latin 1) family, which contains the main characters of the western languages with Latin alphabets. It’s used by many applications on the Internet. For example, ISO 8859-2 (ISO Latin 2) contains the characters for Central and Eastern European languages (such as Hungarian, Czech, Polish, etc..). The ISO 8859-15 is a revision of ISO 8859-1 which introduces the Euro symbol and other characters used in many languages. ISO 8859-16 is used for the Albanian, Croatian, English, Finnish, French, German, Hungarian, Irish Gaelic, Italian, Latin, Polish, Romanian and Slovenian. In particular, it contains the letters “s” and “t” with a comma below to resolve problems with the Romanian language. Some personal sites on the internet tend to abandon the use of diacritical marks necessary for texts written in Romanian. In this way you can write a greater number of words in a short time. Another reason to avoid writing with diacritics is the incompatibility of different types of fonts, which transform these special letters into small squares and other punctuation marks. Also assisted in the translation (or automatic) it is important to use letters with diacritics. Otherwise, the number of errors increases significantly. In correspondence through e-mail, Facebook, Twitter, and other sites, a lack of diacritics is tolerated. But in published material, like newspapers and official documents, a lack of diacritics may cause confusion – sometimes funny, sometimes hilarious. Diacritical marks are required for the preparation of glossaries, dictionaries, textbooks, and other materials. Their inclusion helps avoid unncessary confusion, since their omission can hinder the correct reading of the proper names of people, places, countries and so on. Unicode assigns a unique number to every character, regardless of platform, application, and language. The best solution for the majority of the most operating systems (Windows, Mac, Linux), is the use of unicode commands. The standard for the Romanian language is ISOIEC 8859-16:2001, Part 16: Latin alphabet No. 10, but also includes other languages such as Albanian, Croatian, English, Finnish, French, German, Hungarian, Irish Gaelic (new orthography) , Italian, Latin, Polish and Slovak.